Off-leash recreational activities are a recognition that the half million dog owners and 1.4 million dogs who live in New York City need outdoor opportunities that allow dogs to become properly exercised, socialized, and well-adjusted canine citizens. Science and society recently have recognized that dogs are highly social animals and that most dogs, especially those that live in a congested city environment, require at least a few hours of off-leash time each week. For the past 20 years, three successive Parks Department commissioners have repeatedly praised and thanked the various all-volunteer groups that organize dog owners on a neighborhood level for helping reclaim the parks for all New Yorkers. During the dark days of New York's decline when few people used the parks in the evening or early morning due to crime and fear, the presence of dog owners every day of the year helped reclaim the parks. Those days now seem like a distant memory and today millions of dog owners and non-dog owners enjoy the legacy of Off-leash Hours policy. 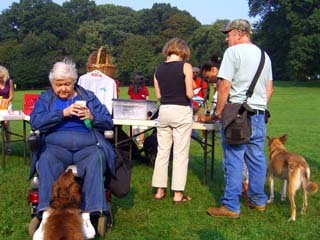 The Off-leash Hours policy allows a few hours each day early morning and late evening for dog owners to utilize certain approved sections of certain New York City parks to meet their neighbors and fellow New Yorkers across social, age, class, and racial lines, and enjoy recreation time with their dogs in a park environment. The Off-leash Hours generally take effect from 9pm to 9am, but are restricted and conform to the official closing and opening hours of each individual New York City park. Dog owners as a group are the most frequent users of NYC parks, utilizing the parks in all four seasons, in all types of weather, day and night, every day of the year. Dog owners, through local dog owner associations and city-wide groups, take a great interest in keeping the parks clean and safe and work hard to self-police off-leash rules in the parks to preserve the 20 year old Off-leash Hours policy. Most people who support off-leash recreational opportunities for dog owners and their dogs also recognize the great value of official dog parks (sometimes called dog runs). The first official dog park in NYC was created in 1990. At present, there are over 40 dog parks in New York City (averaging approximately 30,000 dogs per existing enclosed dog park). Increasing the number of dog parks, while preserving the Off-leash Hours policy in New York City parks will continue to benefit all New Yorkers with better socialized dogs and continue the historically low rate of dog bites. Dog parks are not feasible everywhere where needed due to lack of city funds, landmark restrictions, or community preference, so it is critical that park Off-leash Hours be preserved in conjunction with the creation of dog parks. 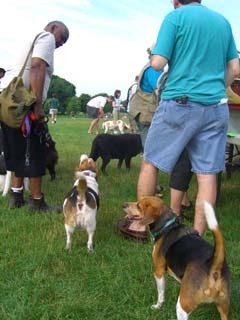 The New York Council of Dog Owner Groups (NYCdog--an umbrella organization comprised of almost all the local community groups who represent users of the dog parks and off-leash areas in New York City) supports a combination of dog parks and Off-leash Hours as the most reasonable and feasible way to provide adequate off-leash recreational opportunities. A 2006 lawsuit attempted to eliminate Off-leash Hours policy in New York City parks. Had the suit had not ultimately failed, it would have resulted in less socialized dogs and a higher number of dog-related incidents. A New York State Supreme Court judge ruled on November 30, 2006 that the 20-year Off-leash Hours policy has been and continues to be legal, and that the Parks commissioner has the statutory authority to permit limited off-leash recreation within New York City parks. The lawsuit, originally filed in May 2006, prompted the NYC Health Department in September 2006 to propose amendments to the Health Code to grant specific authority to the Parks commissioner to allow dogs limited off-leash opportunities in New York City parks. On December 5, 2006, just six days after the State Supreme Court decision, the New York City Health Board voted unanimously to adopt the amendments to eliminate any potential conflict between the Health and Parks Department regulations. The recent legal and public health victories for off-leash recreation have staved off elimination for the successful 20-year policy and, in fact, have strengthened the policy. The recent events have formally declared Off-leash Hours legal, codified it into the Health Code, Parks Department regulations, and also put additional requirements on dog owners that stress responsible dog ownership. First Dog Park (dog run) in NYC created in 1990. How Can You Help Preserve Off-leash Hours Policy in NYC? > Donate to the New York Council of Dog Owner Groups (NYCdog), which is leading the citizens' fight to preserve Off-leash in NYC. The information table during Off-leash Hours in Prospect Park distributes free handouts about Off-leash rules, maps of permitted Off-leash areas. dog license applications, and information about dog vaccination and health.